Grilling has gone beyond flipping burgers over a flame or putting “another shrimp on the barbie”. There are many techniques hailing from all corners of the globe which produce different flavours, many of which we are lucky to be able to experience in Hong Kong’s dining scene. This method of cooking by applying direct – and sometimes indirect – heat to food can be done in all kinds of ways. Britain, for instance, prefers to place food directly under the heat source, whereas in the United States diners want it cooked on top of direct heat. Then there are rotisseries from Persia and yakitori from Japan – a style that has become popular across Asia in which meat and vegetables are put on a skewer and grilled over a charcoal fire. The flavours are also determined by what is burned as the heat source – usually charcoal, wood or gas. Grilled abalone starter at Shoku. We discovered some interesting grills across the city, starting with the newly opened Shoku Bar and Restaurant at The Pulse, which specialises in Japanese binchotan grill. 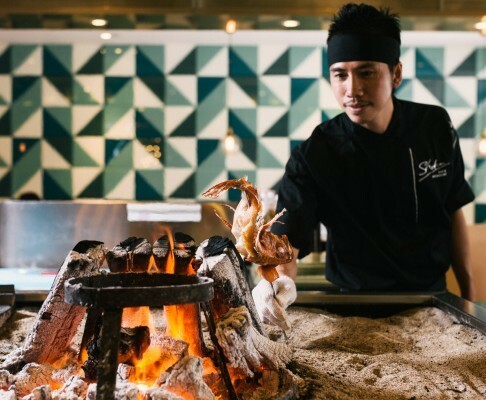 When you walk into the beachside restaurant, the open kitchen centrepiece displays a charcoal grill where head chef Gavin Chow grills fish, seafood and meat. “The whole concept of binchotan is using a high-density charcoal,” Chow says. “There are so many ways of using this charcoal. In Japan, they use it for cooking, for cleaning, for purifying water. Because it is high-density, it holds temperature really well. It’s about 200 to 300 degrees Celsius hotter than normal charcoal. So once you have put the food [on the grill], it seals in all the juices of the food immediately. He makes two great binchotan starters. One is abalone, which only takes three to four minutes to grill indirectly, meaning he places it slightly to the side of the flame. “The nature of fresh abalone is fishy,” Chow says. “That’s why the Chinese stew it for hours and hours. So the way to get around that and also to preserve its essence is to use this sauce made of soyu mirin – a sweet wine, sake and Japanese soya sauce that we make which is slightly sweet, and we add it just before we serve up the abalone. We baste the abalone while it’s grilling.” The result is deliciously tender with a slightly sweet kick. The scallop is also simple but good. “We don’t do too much to the raw ingredient. We don’t over season, and we don’t marinate anything. The charcoal adds the flavour – the scallop is from Hokkaido,” Chow says. “After it is washed thoroughly, it goes straight onto the grill. The scallop’s juices seep out, and then we top it with fried garlic, a little bit of spring onion and soya sauce. This combination actually brings out the flavours of the sea even more. For the main course, we went to Spanish eatery Catalunya, where chef Josep Casas makes a mean Galician Txuleta for three to four people on the Josper grill. The dish is from Galicia in the northwest of Spain and uses 21-day dry-aged bone-in rib-eye. “We take an older cow, as with these kind of cows the meat is stronger in flavour and more tender,” Casas says. “The longer you dry-age the meat, the stronger the flavour. The fat goes yellowish in colour. But we found that in Hong Kong, diners prefer 21 days – not like in Spain, where we prefer 31 or 41 days. “Basically, a Josper grill is a closed grill. Normally, grills are open to the air, but with this one, there is a door – like an oven – with charcoal inside. It gets to a very high temperature when the Josper is closed. You can get the same quality of cooking from a regular grill, but this is a faster process. For dessert, we headed to Italian-American restaurant Posto Pubblico, where head chef Tofiq Khan has created a grilled sweet pizza-style dessert for the eatery’s new brunch menu. Tofiq Khan is head chef at Posto Pubblico. Cioccolato at Posto Pubblico is a grilled pizzastyle dessert topped with bananas and ice cream. Posto Pubblico in SoHo is offering a new brunch menu. “It’s called Cioccolato,” says Khan, who has worked at the restaurant since it opened in 2009. “It’s a grilled and baked pizza stuffed with Nutella, mascarpone, whipped cream, some bananas and topped with cocoa powder, caramelised bananas and ice cream. “We have an iron skillet in which we add a bit of oil, and once we roll out the pizza dough, we stuff it with Nutella and all the other ingredients, then we roll it up and fold it. Then we grill it for a little bit to add a bit of colour on both sides, after which we put it in the oven for three minutes to bake. Once it’s nice and crispy and the ingredients inside get melted, we take it out of the oven and add the cocoa powder and caramelised bananas, and finish with a big scoop of ice cream. It’s very simple really.